"This delicately detailed thank you card is just precious ... it perfectly suits its use, which is for thank you notes for my newborn son." "I ordered these as a baby gift. While I am very happy with how they turned out I just wish they were packaged a little nicer." 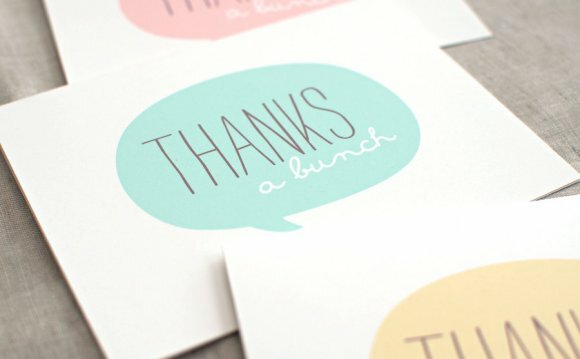 "I love these cards, bought them for my newborn to say thank you to friends and relatives. The paper quality is top notch and the design is simple and cute... would make a great gift for a shower if you already know the baby's name." "I was able to essentially create this thank you to my specifications with little effort because Tiny Prints make it easy for you. We get so many compliments too!" "I ordered these thank you cards for my daughter in law and son to send after my grandson's birth. Everyone who received one called to ask where they were from. I referred your company to many! Quality is exceptional. Colors true to the name. In this case, cool blue and rich brown with my grandsons' name. Will definitely order again, maybe even some stationery for me."